This custom built executive home in Geddes Glen is simply stunning! The home is nestled on an acre lot with gorgeous grounds. The setting offers complete privacy and incredible outdoor amenities. The craftsmanship and design are impeccable. You will notice when you approach on the circle drive that every attention to detail has been included in this custom built estate home. Upon entry you will be taken back by the grand entry with dual circular staircases an impressive two-story, leaded glass doorway. Strike up a conversation or dive into a good book in the formal living room, with a gorgeous stone fireplace to keep you company. 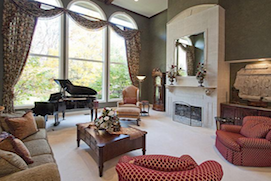 The two-story living room also features soaring windows, with a lush green view of the grounds. The spacious great room is open and bright, with access to the deck beyond, and a see-through fireplace shared with the kitchen, it is perfect for large gatherings with friends and loved ones. 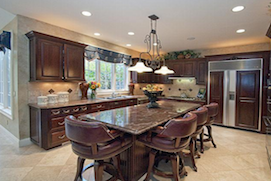 The gourmet kitchen is the heart of this spectacular home, with a large center island topped with granite, cherry cabinetry, and tile flooring, it is truly a chef’s dream. This home also features a paneled den, formal dining room with tray ceiling, and a total of seven bathrooms. The first floor master suite is truly remarkable, complete with beautiful architectural details, direct access to the deck, two walk-in closets and additional room for a sitting area. The master bathroom offers a spa tub, separate shower, two sinks, separate dressing area and a window seat. 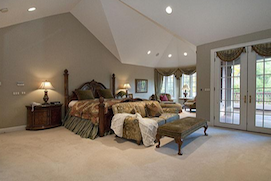 This master suite is luxury at it’s finest. Each of the three additional bedroom suites on the second floor are generous in size with luxurious detailing. The finished, walkout lower level is amazing. A pub style billiard room includes carved oak cabinetry and paneling, a full bar, stunning hardwood flooring and a fireplace. Adjacent to the billiard room is a wine cellar which will hold over 1000 bottles! The spectacular home theater features a stage, fireplace and mini kitchen. The lower level also boasts an exercise room, bedroom and full bathroom. The professionally landscaped back yard provides a resort like feel, with plenty of room for summer barbecues. With an integrated spa, the rear deck provides the perfect place to entertain or relax. 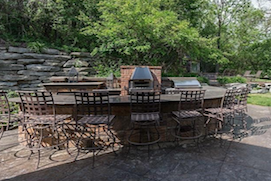 The two-tier patio with full outdoor kitchen including a pizza oven and out door fireplace will be the hub of summer fun. This is truly a one-of-a-kind home, schedule a private showing today of this piece of Ann Arbor residential artistry.